Maggie and Fancy are the heart and soul of our beagle pack! In the pictures above, Ike is holding Maggie on the left and I am holding Fancy on the right. 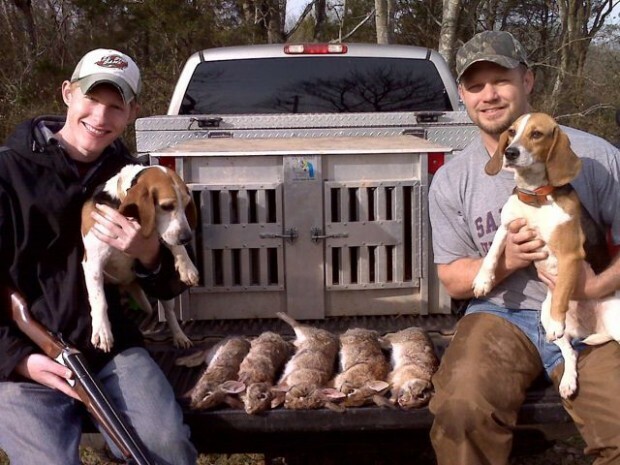 These two females are the hounds we want to take on every rabbit hunting trip. 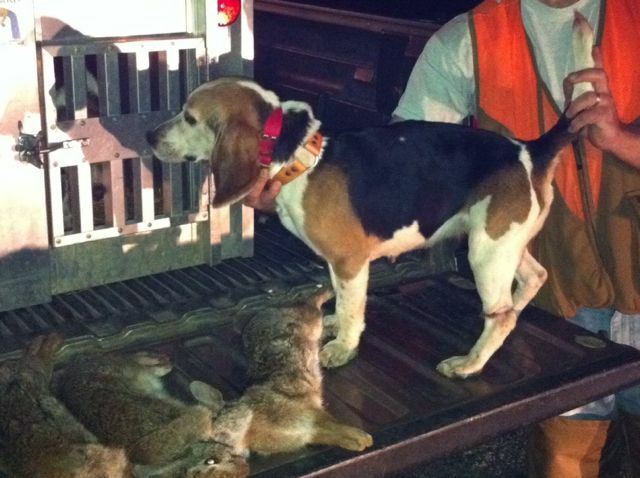 Maggie is not a flashy hound but she is as solid a gun-dog as I have ever hunted over. She works hard, makes few mistakes and is level-headed. Maggie is the measuring stick by which we evaluate all the other hounds we have owned. Fancy is quite the opposite. She is feisty and aggressive. At times she errs on being over aggressive or too competitive, but she makes up for it with her non-stop drive to find a rabbit. Together they make an awesome pair of rabbit dogs. 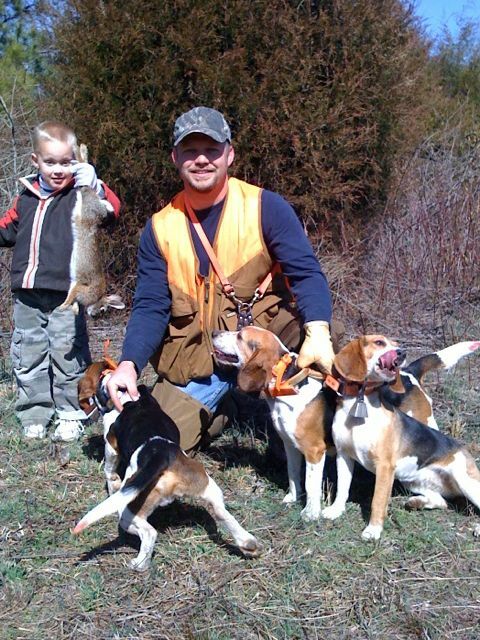 Pictured below, my nephew enjoys showing off the first rabbit of the morning. Maggie is in the middle and Fancy is on the right. We take pride in the fact that both Maggie and Fancy were bred, born, raised and trained here, by us. We love that both are as good as or even better than their sire and dam. 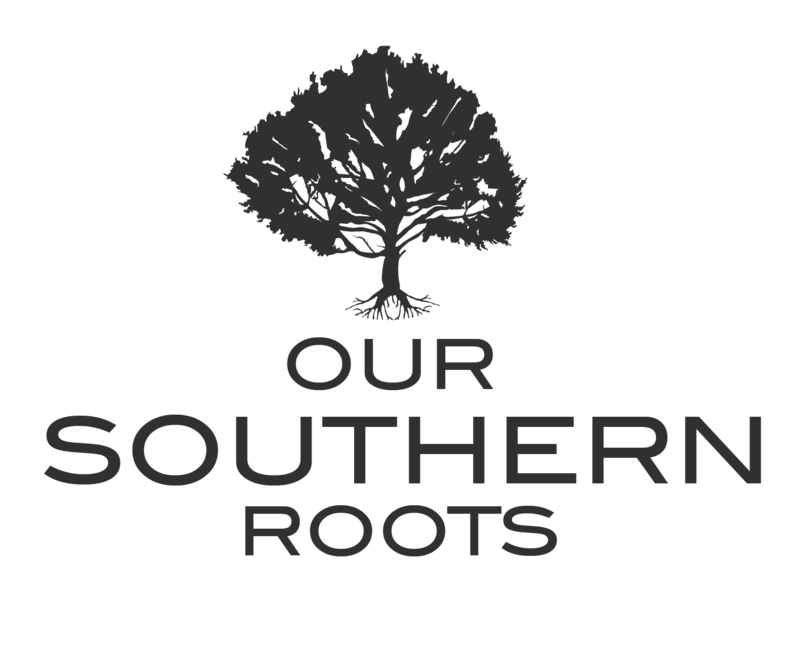 As breeders, our goal is to always to improve the breed. If a breeder is not constantly producing dogs as good as or better than the sire and dam then you should look elsewhere for your puppy. Out of all the dogs in the pack, we consider Maggie to be the top dog. Going on 8 years old, she may be past her prime physically, but there is no substitute for experience. There is no telling how many rabbits we have killed in front of Maggie. She is not the fastest or strongest hound in the pack, but she is smart, doesn’t make many mistakes and consistently works hard every time the tail gate drops. One of the things I most appreciate about Maggie is her unwillingness to quit. At the end of a long hunt when the other dogs start dragging a bit, Maggie still has to be run down and caught because she is not ready to go home. Pictured below, Maggie is tough! A couple of years ago she went missing on a hunting trip. I left the dogs with the other hunters and went looking for her. I found her hanging upside down with her back leg caught in a fence. You can see the visible scar in the picture. I carried her back to the truck and called my veterinarian. He said there was nothing I could do but watch it and see if she would lose her foot due to blood loss. I doctored the cut to prevent infection and anxiously watched to see if it would heal. I am so thankful that she didn’t have any permanent damage. Watching her run rabbits today, you would never guess she nearly lost a leg. It is evident that Maggie holds a place of respect among the other beagles. You can see it both in the kennel and in the field. The other dogs trust her and follow her leadership. In the Southern woods, filled with deer, coyotes and foxes Maggie is completely “trash free” and trustworthy. If young dogs bark on a track that doesn’t sound right, I look to Maggie to see what she thinks of the track. If it is anything but a rabbit she will come back and tell on the young dogs. While we have a number of really quality rabbit dogs in our kennel, we consider Maggie and Fancy to be the core and build the pack around them.